If your rails are not suited to take the fitments for disposable curtains we are often able to adapt them to do so. 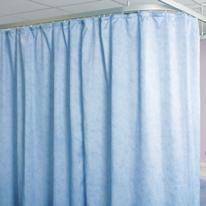 For conventional cubicle curtains we offer the Harrier ready-made cubicle curtains range. With a curtain drop of 2030mm they will fit in perfectly with the standard cubicle track height of 2100mm from floor level. Four different widths of curtain are offered, allowing almost any size of cubicle track to be accommodated. Harrier curtains are stocked in four attractive colourways: Meadow, Sky, Russet and Fawn, to allow coordination with most existing colour schemes. 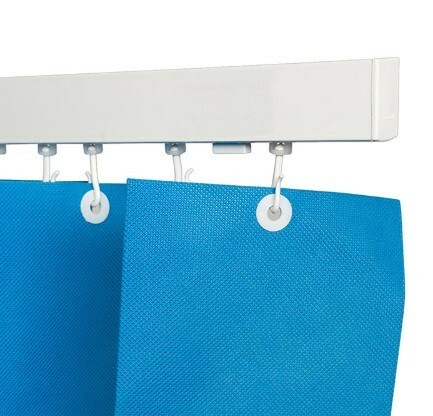 For showers we offer the Harrier shower curtains which are widely used in the healthcare market. They are simple and easy to hang, and are flame-retardant. They are strongly made, with stitched hems and sturdy metal eyelets providing safety and durability. 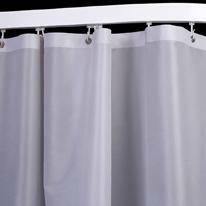 Harrier shower curtain to suit almost any shower track configuration.